Powdery Mildew is a fungus that affects many different plants from different families. The markings of this disease are distinct, and thus extremely easy to spot. 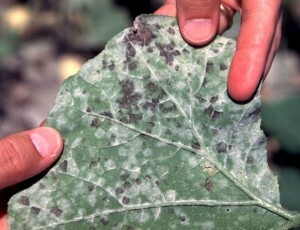 Plants affected by Powdery Mildew have white powdery spots on their leaves and stems, hence the name. The longer amount of time, the plants are affected the spots get larger and thicker. The leaves can be affected at the top or below the ground. Southern California coastal areas are a prime target for Powdery Mildew. Damages from Powdery Mildew have been extremely costly. The key to deter this disease is being proactive with professionals with a proven track record in preventing and treating Powdery Mildew. The professionals at Kastle Kare, have a proven track record of preventing and treating Powdery Mildew. It’s important to farmers and others to try to combat Powdery Mildew as efficiently as possible, to avoid extremely costly damages as a result of deadly Powderly Mildew. The professionals at Kastle Kare have a proven track record in preventing and fighting Powderly Mildew and other such diseases.